What are you doing in the morning on Saturday 24th November? 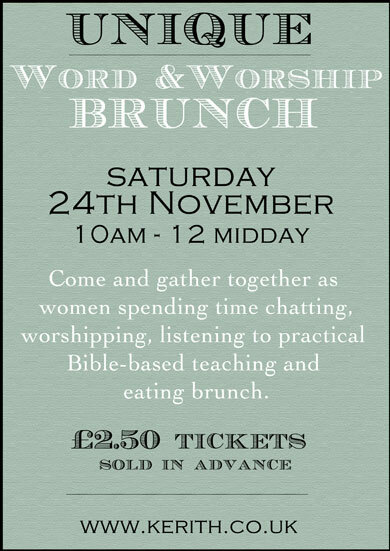 I'm so looking forward to bringing the "word" bit to Word and Worship on Saturday 24th November. I know that the Holy Spirit has been speaking to me, and the message I have is all about Love. No it's not Valentine's, and its not "soppy love". Its all about what it really means to love others - Love not as a feeling, but as an attitude and an action. Pauline and the team are busy planning the Brunch - good quality bacon rolls, fruit, juice, coffee and tea . Helen and the team are busy planning the worship - cant wait! It's going to be a wonderful time together - hope you'll be there too! Tickets are £2.50 each, and the event is for all women , so please invite friends along too. I already know of a group of 7 friends from another local Church who will be joining us. Please let's make sure we have a great turn out from the Kerith girls too! Even the most confident girls sometimes struggle with going to events on their own, especially if they don't think they'll know anyone, so let's all be looking out for one another. 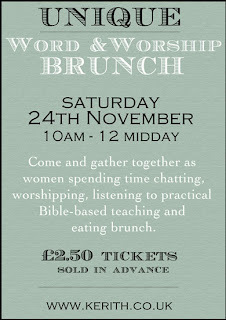 This is an ideal event for making and developing friendships with other women - something we all need and want. It helps with the parking if we all car-share, and its more fun too! Tickets are on sale during the week from Kerith reception. Cut off date is Wednesday 21st November, to help us with the catering. We'd love to meet you, so why not buy your tickets from the Unique table in Kerith reception between each of this Sunday's meetings?